Are you looking for a pickup truck with a little something extra to offer? 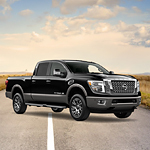 The Nissan Titan XD is a popular full-size pickup truck and it has great accessories available to make your life a little better. There are Titan boxes available for the Nissan Titan XD that can help you haul your tools around, keep drinks secure while driving, and simply stay organized while on the go. These boxes are waterproof and perfect for holding drinks and ice. These boxes are lockable and perfect for hauling valuable possessions. You will find yourself putting these boxes to use on a regular basis. If you find that you struggle to get into the bed of your pickup truck, you can add a special accessory to the truck to make things easier. The Nissan Titan XD offers you a rear bumper step assist that you can add to the rear of the truck for easy access to the truck's bed.